So i've been seeing this comment for awhile about the end date for a wireless charge pad being January 2013. Yet, i can not find the presser or ad that confirms this, anybody have a link to this? I dont think it is in ATTs presser unless im totally blind. It shows up on the Premier site. Someone around here had a photo of an ATT document detailing the promotion the very same day that the Nov. 9 release date was made official. On that document, it listed the date range of the promotion as being from Nov. 9 to some date date I couldn't see totally, but clearly ending in 2013. This was part of the AT&T/Nokia negotiations that delayed the release for so long. 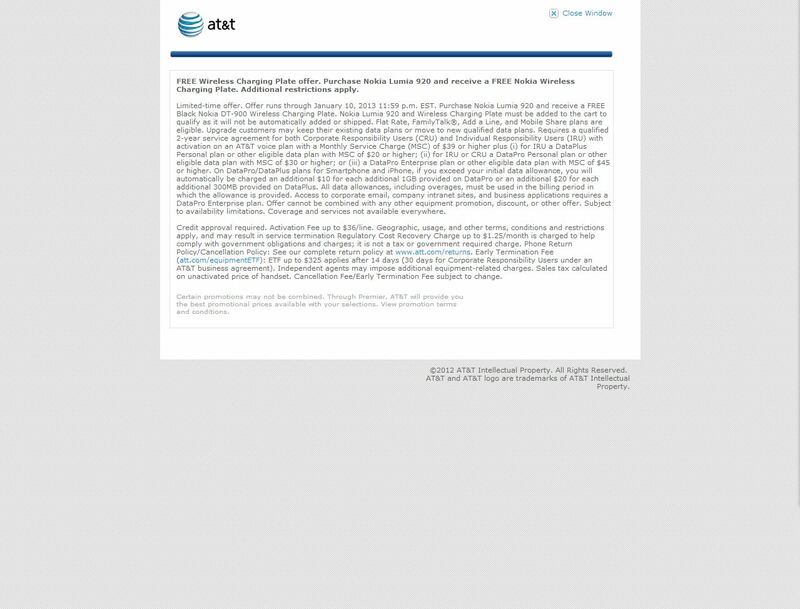 AT&T agreed to do a bulk buy of the black charging pad and bundle it at that great price. That's why you don't have a choice of color for the pad. How do we get the pad? I'm trying to preorder, but it doesn't show up anywhere in my cart or an option to add it. Called ATT and they rep said that it wasn't even a promotion through ATT... ??? It seems to only be showing up for Premiere customers. I don't see it on the website either. I'm going to wait and see if any news comes out about it tomorrow when the phone releases.